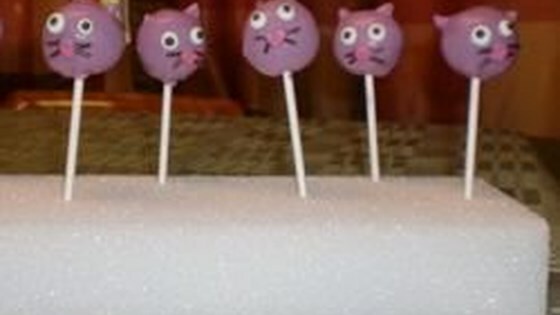 "The cake pop craze has hit me pretty hard! These yummy treats are a lot of fun for Mother's Day, birthday parties, bridal showers, etc. And an absolutely perfect way to practice portion control." Poke holes 2 to 3 inches apart into 1 side of the foam block using a lollipop stick. Preheat oven to 350 degrees F (175 degrees C). Grease and lightly flour a 9x13-inch baking pan. Beat cake mix, water, eggs, and oil in a bowl with an electric mixture until blended. Pour batter into the prepared pan. Bake in the preheated oven until a toothpick inserted into the center comes out clean, 23 to 28 minutes. Let cake cool until easily handled, about 20 minutes. Crumble the cake into a bowl using your hands, discarding any hard or lumpy pieces. Mix in frosting until thoroughly combined. Line a baking sheet with waxed paper. Roll the cake mixture into 48 uniformly sized cake balls. Arrange cake balls on lined baking sheet. Cover with plastic wrap. Freeze until firm, about 20 minutes. Melt confectioners' coating in a microwave-safe glass or ceramic bowl in 15-second intervals, stirring after each melting, 1 to 3 minutes. Remove 3 cake balls at a time from the freezer. Dip the tip of a lollipop stick into the melted coating, then insert stick halfway into a firm cake ball. Dip cake ball into the coating; tap to remove excess coating. Scatter sprinkles over the cake ball. Stick cake pop upright in the prepared foam block. Repeat with the remaining sticks and cake balls. Use any flavor cake mix, frosting, and candy coating you prefer. Feel free to decorate your cake pops with any candies, nuts, or dried fruits you desire. Sprinkle or dip your candy/cookies over wet coating if you're just going for a 'candy apple' kind of look. place finished cake pop in styrofoam stand to dry. If you're looking for more detailed decorations, you can wait until the main layer of coating dries, then use a little bit of candy coating with a toothpick to 'glue' on eyes, noses, whiskers, etc. You can flavor your coating using flavoring oils. You can thin out your coating using paramount crystals (found at cake and candy supply stores and online). Do not get water in the candy coating! The directions for making cake are based on the particular brand mentioned. Follow instructions on box if using a different brand.